While 4K Ultra HD TVs are still on the expansion way and 8K displays are yet at the booth, 10k resolution comes forth quietly. Shot with PhaseOne IQ180, the 10k Timelapse Demo created by Joe Capra immediately amazes video buffs with its extreme resolution and extraordinary image. 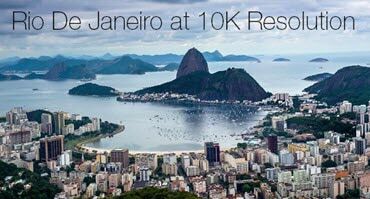 In some way, 10k makes it a buzzword but leads to confusion: How 10K differs from 4K and 8K? What's the video effect in 4K UHD, 8K or 10 FUHD? For that reason, the 4K vs 8K vs 10k comparison will be presented to you, covering the 4k/8k/10k resolution explanation, best 4k UHD TVs/monitors, as well as the easy solution to download 4K and 8K videos on Mac/PC with high quality. • Supported Video/Audio Formats: What is 4K/8k/10k resolution video format? Technically, there aren't any differences among 4K video formats and 8K, 10k ones. Numbers of TVs in 4k/8k/10k have added support for VP9 & HEVC/H265, both of which boast high compression efficiency and are expected to become mainstream format for HD quality. Yet, when you stream 4K video from YouTube, the minimum Internet speed required is about 15-20mbps, let alone 8K or 10K video streaming. Thus, online playback of 4K/8K/10K video will render a huge burden to your bandwidth. Comparatively, it would be better to free download 4k, 8k or 10K videos for offline smooth watching. 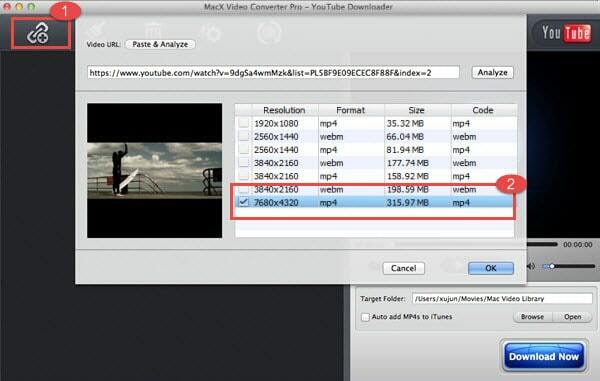 To do that, MacX Video Converter Pro is a professional UHD video downloader you can try, allowing you to free download 4K 8K 10K video movies from YouTube, Vimeo etc. It also transcodes codecs of 4K 8K 10K among HEVC, VP9, H.265, converts ultra HD video to MP4, MKV, AVI, MOV, as well as compresses 4k video to 1080p/720p, 8k/10k to 4K/2K or lower resolution at no.1 fast speed, thanks to the unique Intel/Nvidia/AMD hardware acceleration technology. • What is UHD, FUHD, QUHD: UHD (Ultra HD) measures a 3840x2160 display resolution. Generally, UHD is deemed to 4K. Compare 8k with Ultra HD 4K, 8K is taken as Full Ultra HD boasting a resolution of 7680x4320 pixels. While much higher than 4K and 8K, 10K QUHD is a display resolution of 15360 x8640 pixels. The QUHD is 4 times as many pixels as 8K FUHD. So is between 8K and 4K or between 4K and 1080p full HD. • What Is 10K Resolution, 4K or 8K Resolution: 4k resolution refers to a display with horizontal resolution of 4000 pixels. Compare 4K and 10K, 8K measures a horizontal resolution of 8000 pixels. While 10k is a successor to 8K and 4K resolutions and is supposed to the highest UHDTV resolution so far. Slightly lower than 16K 10K has a staggering 10328 x7760 resolution. To be Exact, 10K is 1.25 times of 8k resolution, 2.5 times of 4K resolution and 10 times of the resolution of Full HD. • Frame Rate: 4K has a frame rate of 60fps like iPhone X/8/8 Plus recorded 4K video while 8K is faster than 4K with frame rate at 120fps. Despite Rec.2020 doesn't show for 10K frame rate, 10k will be undoubtedly more than 120fps, compared to 4K and 8K. • Viewing Distance and Angle: Tests show that 4k resolution isn't fully apparent until you sit as close as 3.6 feet for a 55-inch screen. But if you are monitoring 8k content, a 65" screen is the best. Please watch from 3 feet away, which leads to a viewing angle of 160o. Right now, there are not any info about the viewing distance for 10K. But we will keep it updated. • Color Depth: The 4K UHD has color depth of 10-bits or 12-bits while 8K at 48-bit video. And we stay optimistic to 10K, though the exact color depth of 10K is still unknown. We will instantly update 10k color depth once the information leaks. • Best 4K/8K/10K TVs and Monitors: One year ago Sharp broken the perceive that 4K is the ultimate LCD TV resolution. But a 82" 10k display at 10240x4320 resolution revealed in SID Disney Technology Week 2015 proves such TV offers better image quality. Insider said common users wouldn't differentiate 4K and 8K, except those applying professional detector. So similar to 8K TV, 10K is still undistinguishable by the naked eye. In a sense, 4K monitor is estimated to reach peak in 2018. While 8K, rather than 10K, is the final 2D TV format and still needs over 20 years for its popularization. But we still stay optimistic to the 8K and 10K monitors in the future as this is an inevitable trend, and the 10K monitor tech will be possibly applied to high-tech field in ecommerce or aerospace. How about 4K/8K/10K video player? We can find few 10K video player yet and 8K video player is still on the way, but there're some 4K video players that are able to play 4K & 8K videos without any hassle. To play 4K 8K 10K UHD videos without freezing, you are recommended to download UHD videos first. After that 5KPlayer is highly recommended. It's a 100% free media play to play 4K 8K 10K UHD videos on Mac and Windows PCs. Though the resolution of the computer display may prevent you from watching the Ultra HD video clearer, it does allow 4K 8K 10K video playback. Still, with this video player, you can also free stream UHD video from PC/Mac to Apple TV and airplay video from iPhone iPad to Macbook Pro/Air smoothly and clearly as well. YouTube is now available for 8K video stream and you may come across the 4K and 8K videos on Vimeo as well. And this 4K vs 8K vs 10K comparison also introduces the solution to download 4K/8K FUHD videos/movies for smoother playback on your computer and TV in case there is no internet connection. In consideration of its complicated decoding for 4K and 8K videos, here MacX Video Converter Pro is highly recommended. This 4K/8K video converter & downloader is professional in downloading 4k, 5k, 8k movies/videos and even 10k video if the resource is available. Its 420+ preset profiles allow you to even download 4320p, FUHD, Quad UHD movies from YouTube, Vimeo, Dailymotion, Metacafe, and 1000+ sites to iPhone, iPad, Android, televisions, game consoles, etc with a few clicks. This program will leave you the optimal settings including video format, resolution, frame rate, etc if you are naive to the parameter settings while fastening the 4k/8k video processing speed at 50kb/s. That means you can therefore play the high-definition videos on Samsung 4K TVs, Sharp 8K monitor, iMac 5K with retina display and even 10K televisions without a hiccup. Below we take the 8K video as an example and guides you to download 8K video on Mac/PC. Please bear in mind, even though the 8K video downloader/converter demonstrates a 5X faster speed than others, your internet speed is also one main factor in 4K 8K video download. 1 Add 4K/8K video URL. Free download 8K video downloader for Windows or Mac version for Macbook Pro/Air, iMat etc., install and run it. Click the YouTube button on the top site. Find a UHD movie or video from YouTube or other online sites, then copy & paste the 8K video URL to the address bar. 2 Analyze the 8K movie link. Click "Analyze" button beside the address field. Then you are allowed to choose the resolution (7680x4320, 2560p, 1080p, included), formats (MP4, FLV, WebM, etc), codecs and sizes from the drop-down window. Here you are advised to choose an output in 7680x4320, MP4 format to download 8K video MP4. 3 Choose the Output Format. If you only want to download 8K video in MP4, please skip this step. For a smooth playback 8K video on iMac 5K, 8K TV, 4K monitor, computer and more, please choose the exact profiles from the drop-down window. 4 Begin downloading and converting 8K video. When all settings are completed, hit "RUN" button to begin downloading the 8K video. 4K, 8K and 10k really amazes us when on large screens and produce IMAX-like content. In total, 8K and 10K are great for large monitors (15 feet) in small spaces and displaying fine art still image. They will become the standard for cinema but are unsuitable for stadiums and billboards as a result of its viewing distance.